A Winter Storm Watch for North Texas has been upgraded to a Winter Storm Warning in effect from 6 a.m. Sunday through Noon on Monday. Saturday will be breezy and cold but generally dry, but according to NBC 5 Meteorologist Lindsay Riley, precipitation will move in from the west throughout the day Sunday. Rain mixed with sleet will move into the Metroplex by the evening hours and continue overnight and that could snarl the Monday morning commute. While the Fort Worth Independent School District is out for the Thanksgiving holiday week, the Dallas Independent School District has classes Monday and Tuesday. 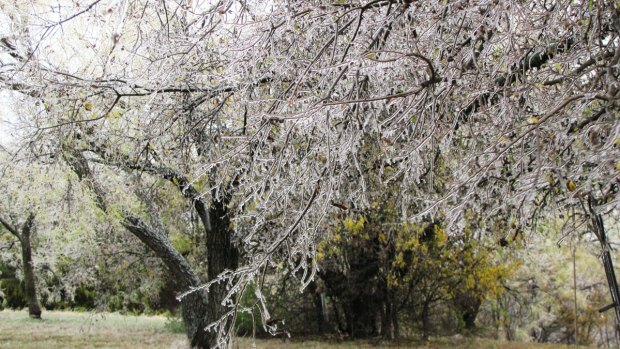 Freezing weather has reached parts of North Texas with ice settling on bridges, trees and cars. Several airlines have started the de-icing process at DFW Airport. DISD spokesman Jon Dahlander said the district is taking a wait-and-see approach. "What we do in these situations is, we have crews that will be out on the road the night before and then also the morning of, and we'll be able to make a decision at that point," he said. "And we'll do a full-court press letting everyone know. We’ll let all the TV stations know. We'll put information on our website. We'll also send a school messenger call out to all our parents." The Texas Department of Transportation said it would monitor the weather and, if necessary, treat many of the bridges in the Dallas-Fort Worth area with anti-icing materials. NBC 5's Amanda Guerra, Kevin Cokely and Brian Scott report on winter weather and ice that moved into North Texas. "The first thing we attack are bridges," TxDOT spokesman Ryan LaFontaine said. "We have more than 3,300 bridges throughout this district, and there are some that are worse than others as far as freezing." TxDOT said the Dallas and Fort Worth districts have stockpiles of chat, a sand-and-salt mixture, and salt-based de-icers prepared for winter conditions. "As of now, we're monitoring the situation, waiting to see where the weather goes and where the areas of need are," LaFontaine said. "We have equipment strategically placed throughout the district, and it's in place where it can be quickly mobilized. We're going to keep an eye on the situation and when see temperatures drop and conditions worsen, we'll be ready." 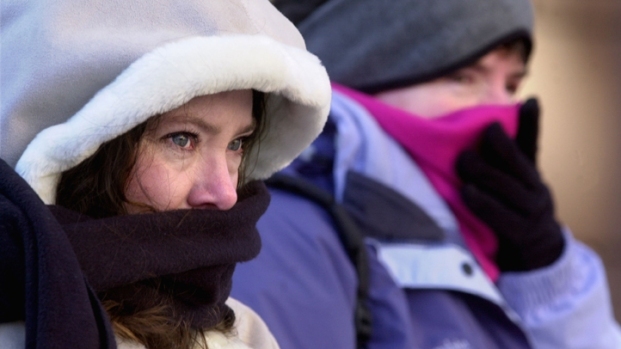 Temperatures generally west of the Interstate 35 corridor were to plummet from the 60s and 70s on Thursday to freezing and below on Friday and Saturday. TxDOT urges drivers to use caution and watch for patches of ice, especially in shady areas and on the shoulders of roadways. Drivers can get travel information by calling 1-800-452-9292 or by visiting www.drivetexas.org. 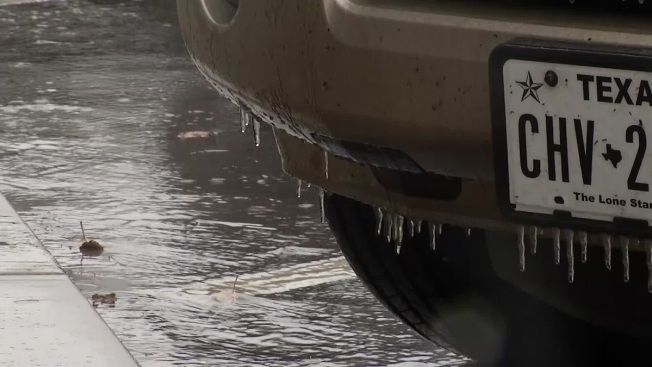 The Texas Department of Public Safety also urged drivers to take precautions, including keeping blankets or sleeping bags in vehicles in case they are stranded. NBC 5's Amanda Guerra reports from Aledo in Parker County where ice was forming on cars, fences and trees. At Dallas-Fort Worth International Airport, extra ground crews are on standby ready to keep runways and planes free of ice. "If snow is coming down or freezing rain or whatever, they've got to de-ice it, anti-ice it, and it has to be done correctly so that the passengers can safely get to where they're going," said Darrin Pierce of the Transport Workers Union. On Friday afternoon, three airlines had started de-icing operations. American Airlines said its de-icing teams and the equipment are ready at a moment's notice.